I came across of video on YouTube of what is called the first animation featuring a dinosaur. It is a short animation from 1914 by Winsor McCay. 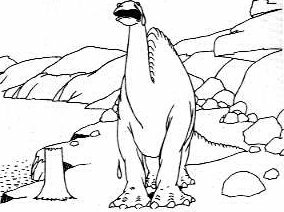 Gertie was based off an Apatosaurus dinosaur fossil skeleton (known at the time as Brontosaurus). There is also a mammoth for comic effect later in the film. An odd appearance of a winged dragon flying across the screen shows up as well. This Wikipedia article about this film explains that the animator was not sure of the mechanics of the dinosaur standing up was so the flying lizard was added to draw the viewer's attention away during this event. The film introduced a number of animation techniques like keyframing, tracing paper, registration marks and looping frames to show movement. The film is part of the U.S. National Film Registry. The film below is just the excerpt of the animation from the 1914 original, it lasts about 5 minutes. This next video shows one of Winsor McCay's last animations showing how Gertie evolved in animation terms from 1921. It was from a never finished short entitled "Gertie on Tour". Below is a embedded video link to the full movie short from 1914 that is about 14 minutes long. It features a side story about visiting the American Museum of Natural History and a bet to make one of the dinosaurs move.